It's Day 5! Today is about a tree skirt. I love things that bring back memories and have special meanings. 3 years ago, I got tired of the boring, cheap, white tree skirt I had and decided to make one. I bought some inexpensive red wool felt from Joann. I cut it into a large circle, then made the slit and cut a small inner circle that goes around the base of the tree. I then sewed some white ric-rac onto the edges. 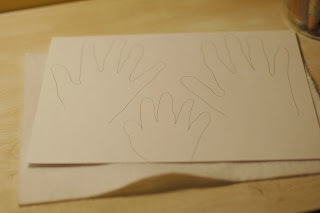 Then wanting to add a personal touch, I traced my kids' hands and cut them out of felt. I have been repeating this for 3 years now. I love looking back and seeing how much my kids' hands have grown. It will be interesting when I run out of room on the front. I guess I'll have to flip it over and do the handprints on the back side too. Keep coming back for the next 7 days for more Christmas ideas. I just LOVE your posts!! You have the funnest ideas and make them seem so simple...thanks for your inspiration!!! Another one to bookmark. I'm totally doing this too. Totally.